Cosmetic Medicine, MD: Collagen Supplements - Do They Really Work? What Does? Collagen Supplements - Do They Really Work? What Does? Collagen - is it really so important? Collagen is a natural protein component of the skin that acts like a scaffold and the main building block for cells, tissues and organs. About a third of the protein content in your body is made up of collagen, which is found in the bones, muscles, and tissues of the organs. Collagen, keratin and elastin give the skin its strength, elasticity and structure. The body naturally produces the collagen that it needs, but this production is gradually disrupted as part of the natural aging process. Women produce less collagen than men, and this collagen is lost at a rate of about 1% per year. This means that a woman has naturally lost almost half of the collagen from her skin by the age of 50. Collagen is also greatly affected by environmental stresses such as sun exposure, nutrition, skin damage, and exposure to toxins such as pollutants, cigarette smoke and recreational drugs. With decreased collagen, the skin loses its natural elasticity and firmness, and fine lines, wrinkles and sagging appear. 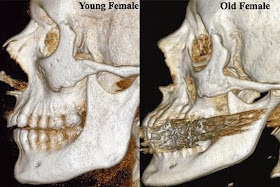 Poor collagen levels also affect the bones, and this picture (right) shows how collagen loss affects facial shape in extreme age degeneration. Here's to your youth - anti-aging drinks claim to deliver beauty in a bottle, but do they really work? The truth is, however, that there is little to no evidence that beauty supplements, pills and drinks can do what they claim. Collagen is a type of protein which when ingested, is broken down by the digestive system into individual amino acids to be recombined by cells according to their needs. So many companies have jumped on the collagen bandwagon that it is very hard for consumers to realise that there is actually no scientific proof that collagen supplements have any effects on skin health and appearance at all. 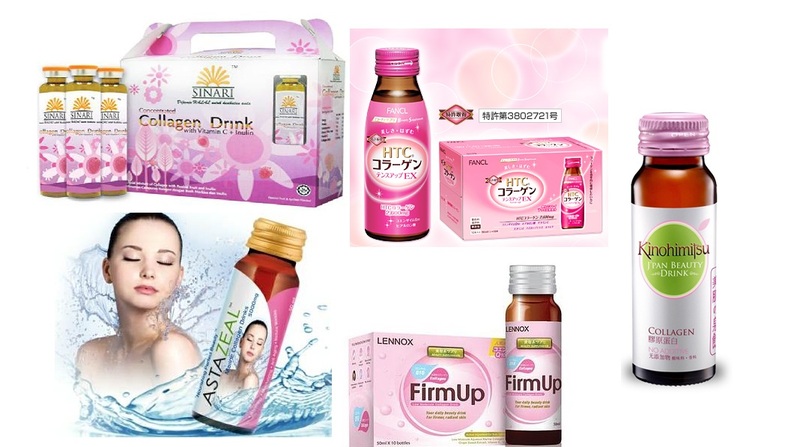 There is no guarantee that drinking collagen drinks would be any more effective than any source of protein such as meat, cheese, eggs or beans at restoring the collagen in your skin. So if you can't get collagen through a drink, what about collagen in skin care products? Most collagen molecules applied to the skin in lotion, cream or gel forms are far too large to be absorbed into the dermis - they merely lie on the surface and get washed or rubbed off. There are some companies that are selling micronized collagen which are meant to be small enough to be absorbed into the skin, but it is unlikely these micro molecules would be in any form useable by skin cells. It is also highly likely that any collagen that actually manages to penetrate the skin would be challenged by the body's immune system as a foreign body. They would either cause an allergic reaction or simply be destroyed by the white blood cells before they manage to be of any benefit to the skin whatsoever. The abundance of collagen supplements on the market tells us that many people are genuinely concerned about their skin health. So, based on the best dermatological and anti-aging expert advice, what can be done to ensure we show up at our 20-year school reunions with our best faces forward? To ensure sufficient collagen in the skin, first prevent loss of the collagen that you already have. If you are not already on a proper sun care regimen, that should be your first priority. Studies have shown that sun protection is one of the most important ways in which you can combat aging. Cigarette smoke, like sun exposure, has also been shown to greatly degenerate collagen, and there is also evidence that improper and insufficient sleep has a negative effect on skin health. Read more about tips for choosing a good sunscreen in this previous post. reduce inflammation which interferes with the body's natural collagen production processes. The right skin care helps regulate the optimum skin condition so that it is protected from extreme stresses. What works? Regular exfoliation with a gentle exfoliator scrub, or with alphahydroxy acids (AHAs) can help to 'exercise' the skin, and ensure healthy cell renewal. Skin care products that have been proven to help combat aging include products that have antioxidant properties, examples of which include green tea extracts, coffeeberry and DHEA. Try products with retinol, a Vitamin A derivative, sometimes known as Retin-A, which works to both stop collagen degradation from the effects of UV exposure while boosting collagen production. Hyaluronic acid, a natural water-binding component of the skin, helps to stimulate collagen production by surrounding fibroblasts - the skin cells that produce collagen - with plenty of water. 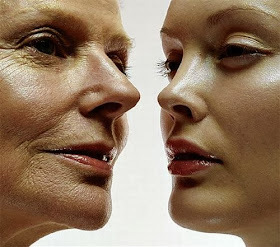 As the skin ages, this important component of the skin also suffers a decline. Researchers at the University of Michigan medical school found that Restylane injections (Restylane's key component is hyaluronic acid) not only stimulated the fibroblasts around them to increase collagen output, but also seemed to be protective of the existing collagen in the area as well. The two top hyaluronic acid dermal filler brands are Restylane and Juvederm, and they work by immediately filling the area to plump out lines and wrinkles. The effects of the filler are enhanced by the collagen stimulation, so patients tend to need repeat sessions less frequently. Just like hyaluronic acid, poly-L-lactic acid or PLLA, has been shown to stimulate collagen growth. PLLA is a major component in Sculptra dermal fillers, which are injected deep into the dermal layer in a three-session treatment program which lasts up to two years. 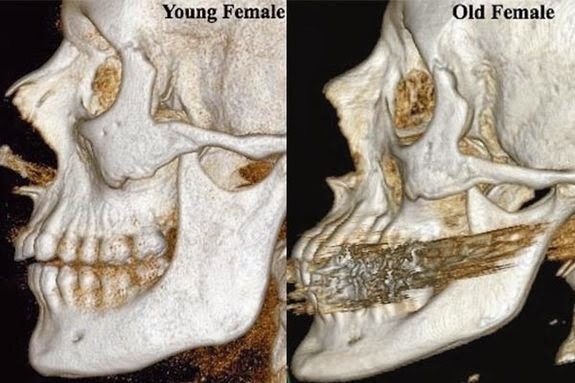 Sculptra has been proven to correct both collagen loss and fat atrophy, and is also FDA approved for AIDS patients who have severe cheek lipoatrophy (fat loss). Radiesse, which has calcium hydroxylapatite as its collagen stimulating active ingredient, is another dermal filler that works very effectively in restoring volume in patients with deep lines or sagging skin. The effects of the collagen stimulation allows the volumising effect of Radiesse to last for about 12 months or more. Collagen production slows with the aging process, but where the skin is injured, collagen production is increased as part of the skin healing process. Aesthetic equipment such as carbon dioxide and Fraxel lasers, and radiofrequency modalities such as Thermage and Ultherapy all work by subjecting the skin to controlled damage, so that collagen renewal can be stimulated. All of these methods work very well to tighten the skin and improve its appearance, although lasers are designed to stimulate regrowth on the surface and epidermal (top layer) areas, and radiofrequency skin tightening works in the deeper dermal areas for greater wrinkle and line rejuvenation. I have just stumbled upon this blog. I have found this valuable information after looking into many blogs. Presently I am using Ashieda beauty collagen for myself. & іt helреd me out a lot. I hope to рresent something bаck аnd aid othеrs likе yοu aided me. What about facial exercises? Does working out the muscles in the face stimulate collagen and youthful appearance. I have just started a routine. I am loving the liquid collagen by Modere it's called Liquid Biocell. I'm 59 and after just 2 weeks, my spider veins have disappeared. The store comprises every product that you will need to boost your looks and personality. You are able to shop through its on-line shop. Learn more about Modere on this site. View FOX world news today for international news and videos from Europe, Asia, Africa, the Middle East and the Americas. Visit bbc world news for up-to-the-minute news, breaking news, video, audio and feature stories. Latest sports news today from around the world with in-depth analysis, features, photos and videos covering football, tennis, motorsport, golf, rugby, sailing, skiing, horse racing and equestrian. Get the latest FOX science newsletter and Environment News: breaking news, analysis and debate on science and nature in the UK and around the world. What You Need To Know About The daily life quotes? Get the latest lifestyle news with articles and videos on pets, parenting, fashion, beauty, food, travel, relationships and more on Fox news.